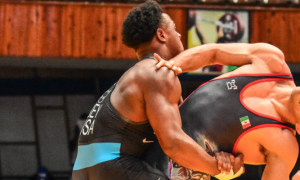 The U23 Greco Euros came to a close yesterday in Ruse, Bulgaria with some up-and-comers rising to the forefront. The action unfolded fairly quickly and a couple of names to keep an eye on sauntered into the spotlight. 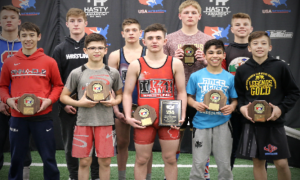 Georgia got the haul of the tournament with six placewinners out of the eight contested weights. Germany and Sweden represented well with a few a piece, and Poland and Turkey bought home a couple of medal winners, as well. A complete list of champions and placewinners is located at the bottom of this page. Note: Despite being listed by the event as participants, neither Shmagi Bolkvadze (GEO, 66 kg) or Robert Kobliashvili (GEO, 85 kg) wound up competing. Mateusz Lucjan Bernatek (POL) just keeps on keeping on. The former Paris Grand Prix champion and two-time Junior European medalist was ranked as high as sixth in the world this time last year, but has since fallen back while his countryman, David Karecinski, began picking up steam. One cure to get back on track is to win a big tournament, which is precisely what Bernatek did in Bulgaria. Bernatek easily got by Mihai Mihut (ROU) via 8-0 tech to kick things off ahead of a strange yet dominating win over Elman Mukhtarov (10-0, TF). This one got off to a testy start, as Mukhtarov repeatedly put his hands in Bernatek’s face, at one point drawing a small amount of blood. A two-point penalty was soon enforced. When Bernatek was given top par terre he immediately turned Mukhtarov (and gave up position), but was not awarded the points due to legs and the match stayed at 2-0. When the next par terre opportunity came for Bernatek, he didn’t miss it. A quick sequence of guts increased his lead to 6-0 before a nasty four-pointer presented itself to end the match. The semifinals saw Mateusz Bernatek taking on Enes Basar (TUR) and advancing thanks to a 7-0 score in what started off as a briskly-paced affair only to grind to a halt. Bernatek took a 2-0 lead on a mid-range PT lift and then hit a couple of guts to increase his output to 6-0. It wouldn’t be until late in the second period when Bertanek would add another point to the match’s conclusive score. Bernatek saved what was perhaps his most dominating and dramatic performance for the finals, where he took on Tornike Jangavadze (GEO). To his credit, Jangavadze bought it straight to Bernatek, but that was also part of his undoing. While trying to nail a headlock on his considerably taller opponent, Jangavadze came up empty. Bernatek reactively locked his arms around the Georgian’s waist before wrestling him to the floor for two points. Immediately, Bernatek punched through three guts to secure his gold at the 2016 U23 Greco Euros. Erik Szilvassy was interested in making a statement, as well. As one of Hungary’s most promising Greco wrestlers, the 85 kg upstart Szilvassy has to use any chances he gets to increase his stock. The U23 Greco Euros provided just the kind of platform he would need. His first victim of the day also proved to be his closest match. Dimitrious Tsekeridis (GRE) tried pushing the pace, even gaining a caution par terre advantage. In fact, both wrestlers would wind up trading caution points, as there just wasn’t a lot of action to be had from either side. An unorthodox gutwrench-hip-over delivered the winning points for Szilvassy in the second period. The quarterfinal matched Szilvassy up with Sweden’s Kristoffer Berg. Once again, the margin for error wasn’t huge for the Hungarian. A lift attempt that yielded three points made up the brunt of Szilvassy’s offense. With Berg fleeing the hold on another lift attempt, two more points gave Szilvassy a 5-0 lead, which would be good enough for a 5-1 victory. Nikolaj Dobrev (SRB) was next on the docket. An absolutely gorgeous arm spin by Szilvassy opened up the scoring for a four-point lead seconds into the match. It was mostly an in-fighting affair after the initial points. Dobrev did get a par terre chance in the second frame, but tried too hard to make something happen, overreaching on a gut and getting caught in the rollover. Szilvassy simply hipped over for another two points and played it safe the rest of the way. Similar to Bernatek, Szilvassy’s most demonstrative victory came in the tournament final. Hometown slugger Yoan Dimitrov (BUL) was as good a dance partner as the Hungarian could hope to find, especially given Szilvassy’s reflexive style. The Bulgarian fans were loud and supportive of their guy right from the start, chanting and stomping throughout the arena. Unfortunately for them, the Hungarian contingent was just as loud, making for a raucous atmosphere. In what might be Szilvassy’s most impressive continental performance to date, he played against Dimitrov’s over-aggressive style and took points when they came. Two arrived for Szilvassy on a turn attempt gone bad. Dimitrov rushed the roll-through and as in the semifinals, Szilvassy hipped over to collect on the exposure. From there, he stayed with it, trying to get enough space to maintain a lock. Eventually, Dimitrov had to clear, allowing Szilvassy the chance he was looking for, as he made good on the lift attempt to score the tournament-clinching points. Iakobi Kajaia got started with a fury at 130 kg. 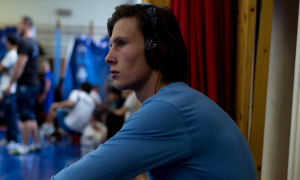 In the qualification bracket, he faced off with Uldis Glazins (LAT) and the two immediately engaged in dueling bodylocks. When two large men are going for the same hold, chances are the one who gets it off is going to come away with something big, and that’s what happened here. 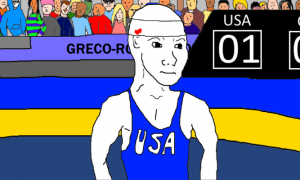 Kajaia hit the bodylock (after nearly losing the position off the arch), giving him four points and the subsequent fall at just :48 into the first period. 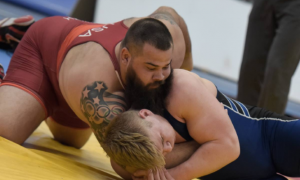 Another stomping was coming up for the Georgian heavy, as he took apart Christian John of Germany 8-0 (TF) to advance to the semis. Here is where his biggest test of the day was lying in wait. Zurabi Gedekhauri, one of Russia’s next generation of maulers, was intent on making things difficult. A takedown off a snap and spin led to two, and coming up next would be the end of the point scoring, as a gutwrench off the position brought on two more. Those four points would provide the total, enabling Kajaia to move into the finals with a crisp 4-0 win. With a U23 Greco Euros title at stake, Kajaia wasn’t toying around. Ukrainian Vladyslav Voronyi enjoyed a similar run of pillaging as he made his way through the bracket. An early arm spin by Voronyi got confirmed for two, but from there on out Kajaia turned things up a notch. Pressing forward, he nearly got caught in another arm spin attempt only this time, he held on for dear life and picked up two of his own off the position. A warning of hands to the face was issued to Kajaia, which did little but provide a different opening of attacks which Voronyi would yet again try to turn into another spin. Kajaia got behind to secure two before cinching up a gut to nab two more. Back on their feet, it became apparent that Voronyi would have to back away from his arm spin-friendly approach. The issue for him was without it, Kajaia was able to keep being aggressive and turned it into a par terre opportunity. Another couple of gutwrenches later, Kajai is the 2016 U23 Greco Euros champion. 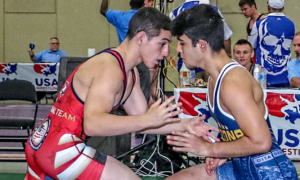 This year’s running of the U23 Greco Euros was a tournament that did not disappoint. 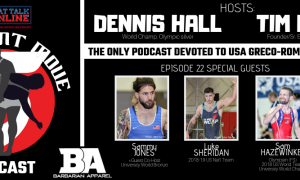 Many of these athletes are sure to become household names in their own countries and around the world, provided they keep getting opportunities like this to demonstrate what they’re capable of. Europe has a ton of teams with immense depth, so finding a requisite number of matches against top-flight competition isn’t often all that difficult. But it’s nice to see it all come together at an event like this, so kudos to United World Wrestling for helping push the movement forward.